Christmas is the living memory of the birthday of Jesus Christ, and a reminder of his eternal teachings of love and compassion. Therefore, Christmas is a great time to celebrate with your loved ones; it’s the time when you exchange gifts with relatives and friends with joy. People decorate their houses and Christmas trees for this day with huge excitement. 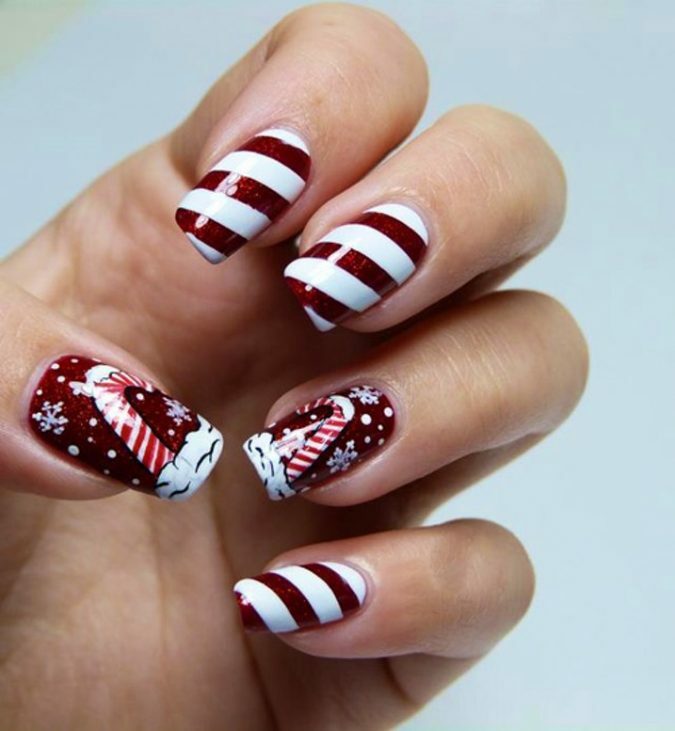 When we decorate everything around us with the Christmas themes, then why not decorate your nails on this Christmas festival. For a lady, nail paint plays a big role in enhancing the beauty of her look. Your nails should not remain plain white this Christmas festival. Decorate them with bright and light colors. Nail polishing had never been such a high profile in fashion and the popular culture as it is today. Young generation ladies and girls are painting their nails to express their individuality, fashion, and creativity. In earlier times, nail art was for grown-up ladies to do, but now young girls are also crazy about it. Whether your nails are short or long, your hands will look gorgeous with a nail winter design that suits them. Following we present you new Christmas nail designs for the coming winter and Xmas. Christmas is a winter festival, and if your nail art will also represent the snowy mountains, it would be awesome. 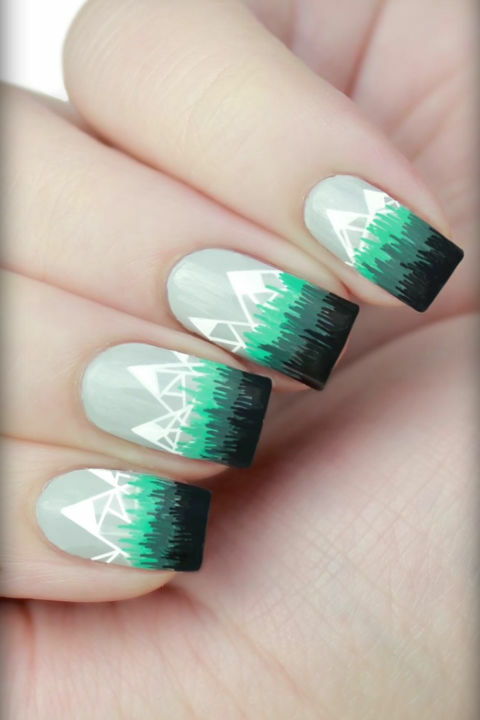 You will love the geometric patterns of the mountainous winter scene on your nails. You can also use acrylic paint to get the gorgeous greens. This nail art design will give a classy look to your nails. Use white and green nail paint to enhance the look of your nails this Christmas festival. Don’t go on the name; you will find nothing ugly in this winter nail art. This Christmas festive design in a seasonal color scheme sounds like the prettiest of winter accessories to us. Don’t think that you won’t be able to draw the sweater patterns on your nails as it can be done with nail stamp easily. You can choose any design of your choice to apply on your nails. 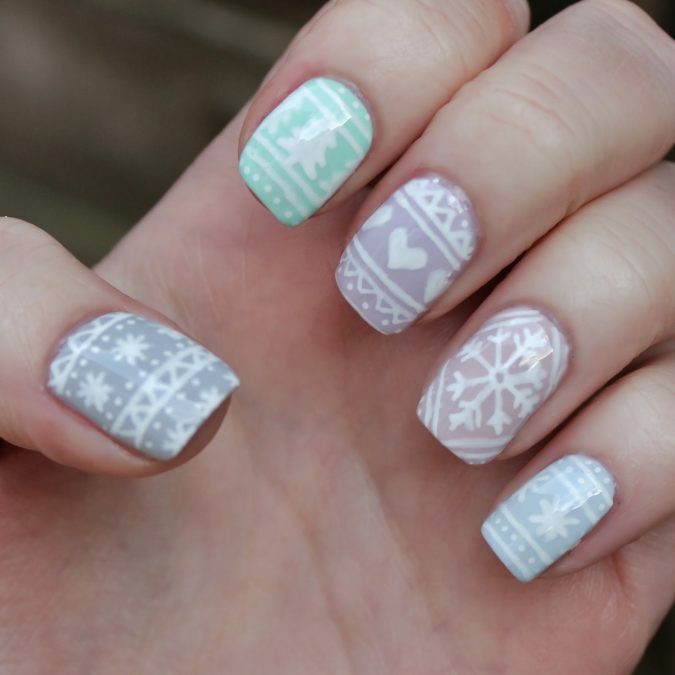 You may have many sweaters with different designs and patterns; you can use those designs on your nails to look cool. This Christmas decorate your nails with festive candy nail art. In this nail design, you will need to apply red nail paint on your nails properly. Let it dry, then make nail art with the white nail idea stick used for painting nails. You can draw different types of patterns with white color on your nails. This white and red colored combination will give a festive candy look. Imagine your nails will be looking like candies which will draw everyone’s attention on the auspicious day of Christmas. Santa Claus is liked by kids very much because they believe that he comes at night to drop them gifts. This Christmas, paint your nails with Santa Claus and show off your nails in a much better way. You will just need to paint them with a red nail paint. After letting it dry, use the nail art stick to draw Santa on your nails. If you found it difficult, use nail stamp prints of Santa Claus. Reindeers are the ride of Santa Claus, and your nails will look awesome carrying an image of the reindeers. They will create a classy and fashion savvy look and enhance the beauty of your nails. Yes, this design is of more details, but there are lots of materials available for little detailing. You can use different colors to make your nails awesome. With reindeers add a little snowy look with a white nail paint. If you are going to a late night party, then you can apply this golden desert themed camel nail art. 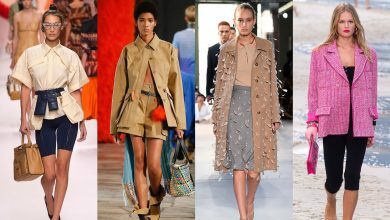 In this wintery holiday, you need to apply a desert design on your nails which will give a contrastive look. 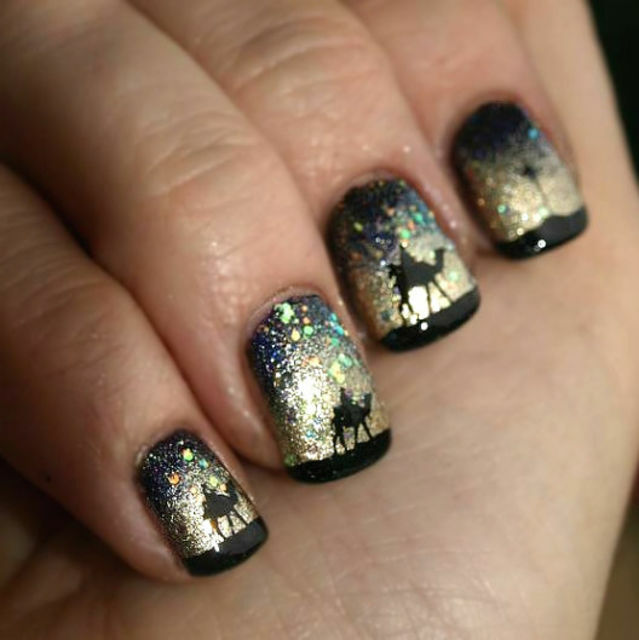 In the golden desert theme, draw camels on your nails. You have no idea, how beautiful it will look at late night. First of all, you need to apply a golden nail paint, then draw a camel with any color you like. If you are not a nail art expert, then you can also use nail stamp prints of a camel. Applying different nail paints on your nails creates a great look, but if you want to add an eye-pleasing look to your nails, color one nail with a different color. Apply a white nail paint to your nails except for the ring finger, although, you can use any color of your choice. After letting your nails dry, you can apply golden sparkling nail paint on your ring finger’s nail. It will be like a cherry on the cake. Go out with sparkling nails for the Christmas Eve party. Applying a simple nail paint is not a difficult task, but when making Christmas designs on your nails, it requires a more detailed approach. There are many types of nail paints available on the market. You can buy the colors you love and related materials from any market near you. If you couldn’t find all the colors and nail art materials you want, there are thousands of colors available on the online websites; shopping websites sell different types of nail art materials. Just make sure to buy from a well-known shopping website. You will get your order in two or three days. Not everyone is a nail art expert; if you are new to it, seek the help of a nail art expert. Nail art designers will turn your nails fantastic.